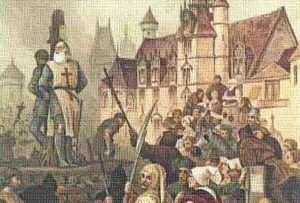 705th Anniversary of the Martyrdom of Jacques de Molay – Zero Equals Two! “Jacques de Molay, (born 1243, Molay, France—died March 19, 1314, Paris), last grand master of the Knights Templar, an order of knighthood founded during the Crusades that had attained extensive power and wealth. He failed to exercise effective leadership at the time of the suppression of the order by King Philip IV the Fair of France and Pope Clement V.